Whip heavy whipping cream until stiff peaks appear. Whisk in brandy and maple syrup. Fold in half of the sweetened condensed milk can with a rubber spatula until blended. Fold in second half of can with toasted walnuts. Transfer to a loaf pan or ice cream tub, cover with plastic wrap and freeze for 6 hours or overnight. For the caramel sauce, melt butter in a pan and whisk in milk and brown sugar. Bring to a simmer until sugar is dissolved. 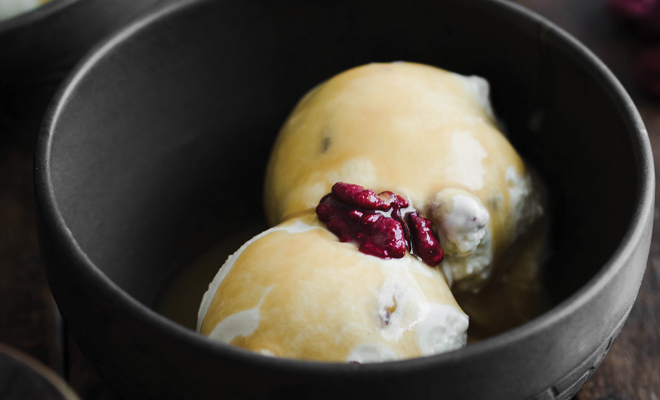 Add a handful of toasted half walnuts Top ice cream with caramel walnut sauce.